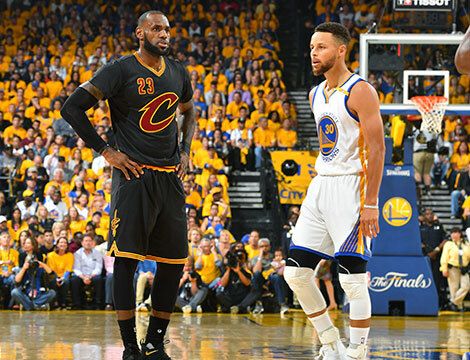 NBA Playoffs – The defending Champion Cleveland Cavaliers are now in a very hard situation of being sweep and be dethroned by the impending 2017 NBA Champion Golden State Warriors after failing to close out a down to wire end of Game 3 at Quickens Loans Arena in Downtown Cleveland. The Cavs came out strong in the game fighting toe to toe with the Warriors from start to finish, it was the closest and exciting game of the series as no team established a double digit lead, but mostly the Warriors are in lead of the game in the 1st half while in the 2nd half several lead changes taken in the 3rd quarter and in the 4th quarter the Cavs mostly handled the lead not until the later minutes of the last quarter. For the first time in this series the defending champion manages to lead in the 2nd half unlike Games 1& 2 they were blown away in the 3rd. this time they manage to hang on through the final quarters and posted their biggest lead of the series by as much as 7 points. Cavs seems on the way of winning Game 3 but things got wrong when the defending champion failed to score in the last 3:11 of the final quarter. The Cavaliers leading by 6 points 113 – 107 with 3:11 to go, but the Warriors slowly coming back from the game. With less than a minute Cavs are still in the lead 113 – 111, LeBron James made a pass to Kyle Korver, who missed a 3’s that might seal the game if it was made but unfortunately is not and fortunately for Kevin Durant it leads to his clutch 3’s to give the Warriors a 1 point lead 114 – 113. Cavs has their chance, but with wrong decision, missed shots and turnovers kill them in the final seconds of the game. The Warriors finish the game in a 11 – 0 run to take Game 3, 118 – 113. LeBron James, had a great game led all scorers with 39 points, 11 rebounds and 9 assist, Kyrie Irving 38 points, 6 rebounds and 3 assist, JR Smith has also had a good game with 16 points but not still enough to lift their team to win the game. While Kevin Durant led the Warriors with 31 points his 3rd straight 30 plus points in the finals and looking good to be the best candidate of winning the Finals MVP. Cleveland Cavaliers is now facing of being dethroned as the NBA Champion this coming Game 4? No team in the NBA has ever comeback in 0 – 3 deficit in playoff history. Last year the Cavaliers made history after coming back from 1 – 3 in the finals, will they make another history as the first team to ever come back from 0 -3? Let’s see, but first thing first they must win Game 4 or else its over for the Cavs and for the King who is chasing the Ghost? No Comment to " Cavs Failed to Close out Game 3, Down 0 – 3 in the Finals "